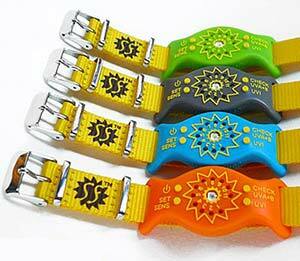 Wear your SunFriend UV monitor for Healthier & Safer Sun Time! Do you want to stay safe in the sun? They key is to know your limits! UVA+B SunFriend is the world’s first customisable, waterproof activity monitor for UV exposure. You can rest assured knowing that its scientific features are based on internationally recognised clinical research and NASA inspired sensors. How will your sunfriend work? Some sunscreens are in fact beneficial, only if you are careful with your selection. Unless the label states that it is "broad spectrum", the cream will not necessarily protect you from both UVA and UVB radiation, and will block the beneficial UVB from reaching your skin. UVB is needed to make vitamin D – and Vitamin D is very good for you, your body needs it. Sunscreens are also packed with many chemicals which your skin may be sensitive to. Some of the ingredients in the sunscreens can be harmful if they should penetrate your skin and enter the blood stream. SunFriend takes care of all your sunshine needs and requirements. It recommends you get a healthy amount of sun, and then choose to cover up properly, go indoors, or use a "safe and organic" broad spectrum sunscreen to avoid over-exposure to more sun which could lead to skin damage. When we are out enjoying the sun we feel great. The sun puts us in a good mood and if you don’t over-expose yourself to it you can reap the rewards of Vitamin D. With your SunFriend you can enjoy the healthy benefits of Vitamin D.
Helps promote growth and stronger bones by increasing absorption of calcium into the bones. And optimal vitamin D levels early on in life have been shown to be a major preventative factor in the formation of diseases such as MS, Diabetes 2, and Osteoporosis. Find a friend in SunFriend for your whole family today!